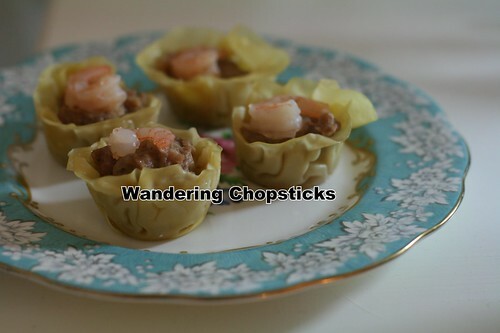 I brought Siu Mai (Chinese Meatball Dumplings) to my brother's lunar new year dinner. 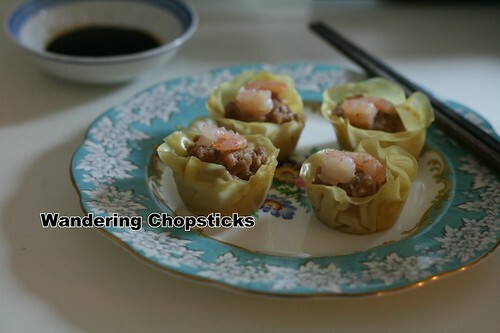 I know, siu mai are usually eaten in the mornings for dim sum, but I needed something quick and easy. 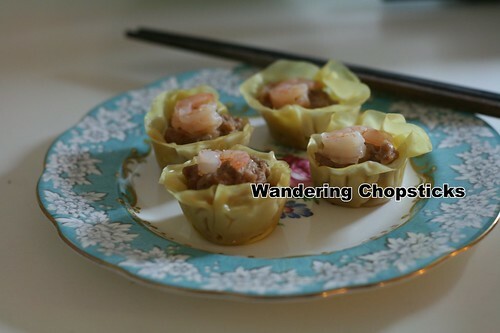 And while I'm perfectly happy getting my fix at dim sum restaurants, there's something to be said about making siu mai at home and eating it late at night. I'm not so skilled with the shaping. 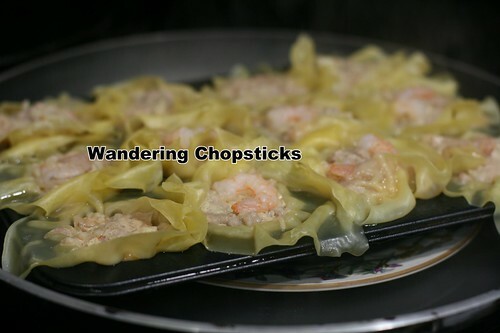 The dumplings waffled to and fro in the steamer. 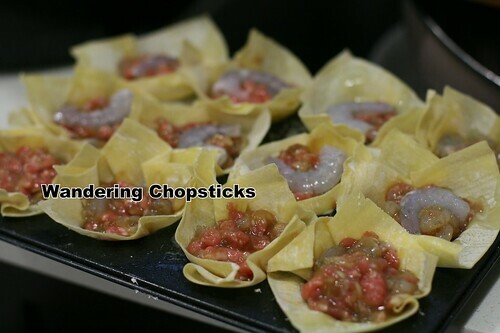 After a few misses, I found it easiest to steam them in a mini cupcake pan. It's cheating for sure, but they come out much nicer if you're not so skilled in shaping them either. 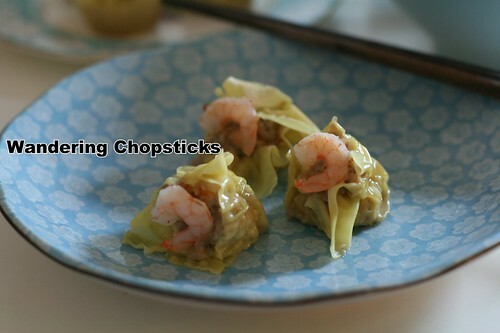 Make them for breakfast, if you want Chinese dim sum at home. 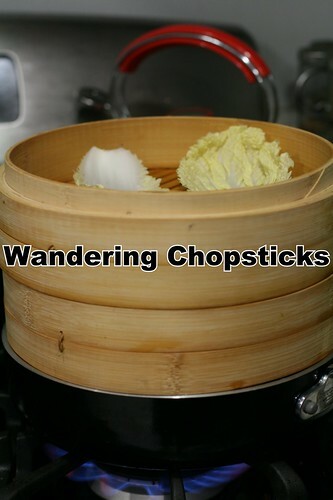 Or make them for a late night snack. 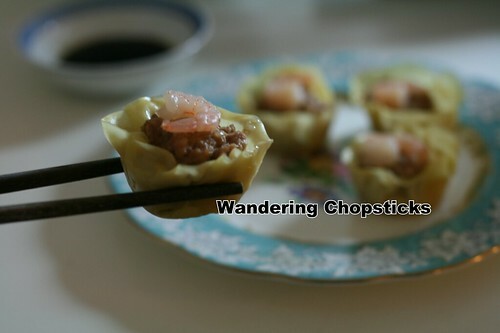 Optional: soy sauce and/or black vinegar for dipping. Peel and devein the shrimp. 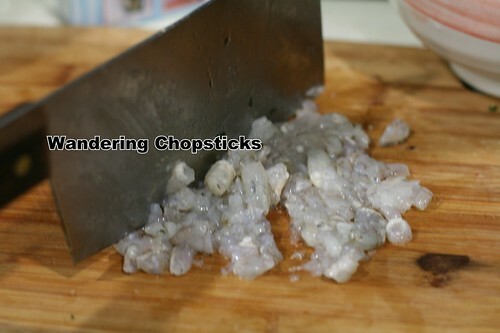 Roughly chop the shrimp like so. 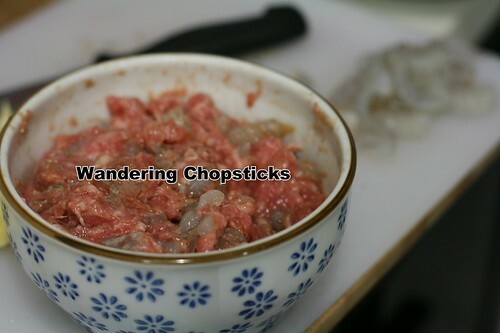 You don't want them too finely minced. 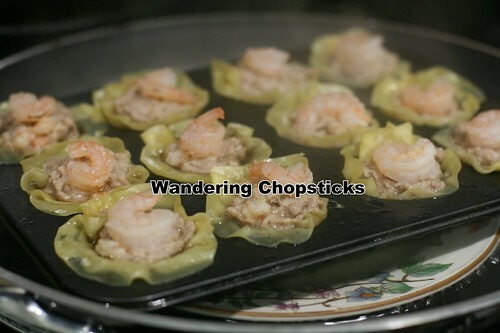 Mix the shrimp with 1/2 lb ground pork, 1/4 tsp salt, 1 tsp soy sauce, and 1 tsp sesame oil. Add water to the pot to boil and prepare the steamer, lining the basket with cabbage leaves if you wish so the dumplings won't stick. 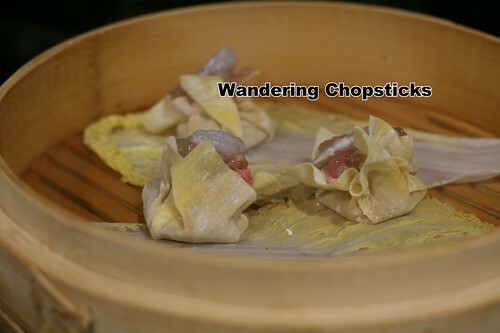 My first attempt was just to freeform shape the dumplings, adding one shrimp on top. 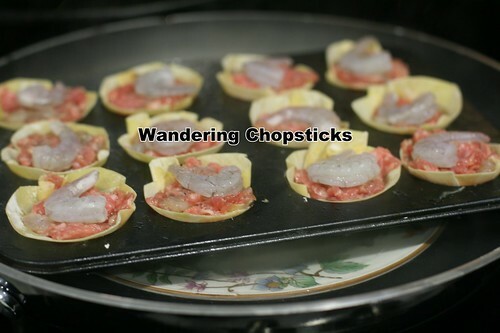 I had a package of wonton wrappers so I lined a mini cupcake pan with them. 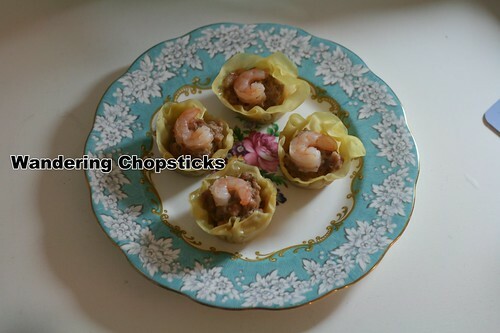 They came out OK, but the leftover edges didn't look nearly as nice as I hoped. Third time's the charm. 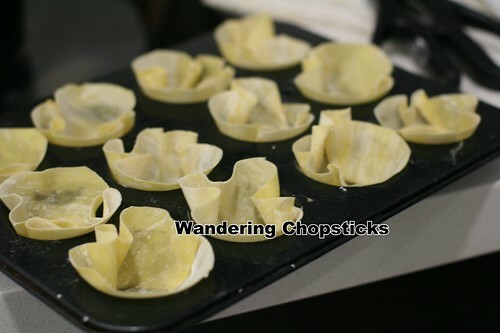 So I cut the wonton wrappers into circles and lined the mini cupcake pan again. 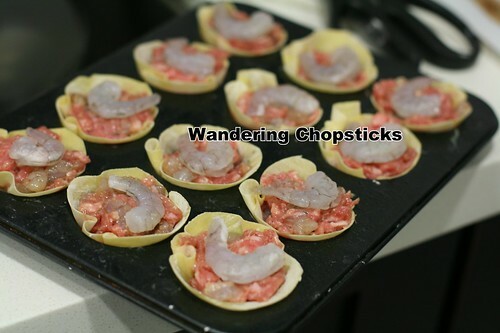 Add the filling and small shrimp on top. If you don't have a steamer big enough, you can do like I did and add a plate to a wide saucepan. Place the cupcake pan on top of the plate. Cover and steam on medium-high heat for about 10 minutes. 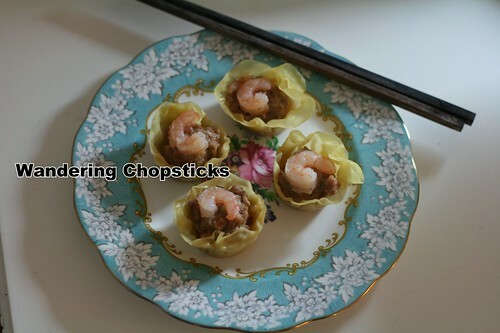 The mini cupcake pan insured uniform shape for each dumpling. Way better than my previous attempts. 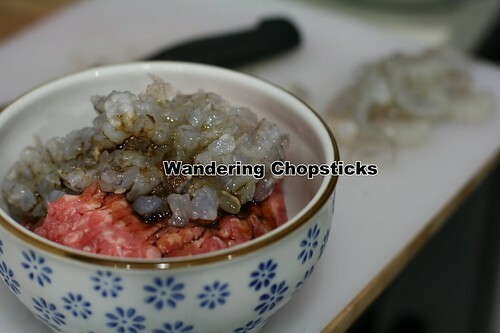 Serve with soy sauce and/or black vinegar for dipping. 3 years ago today, Happy Year of the Tiger. 4 years ago today, Spaghetti and Meatballs. 5 years ago today, Cranberry Juice-Poached Pears with Vanilla Ice Cream. 6 years ago today, the best maple bars ever at Miss Donuts & Bagel - La Verne. Awesome tip on using the mini cupcake pan. Thanks. Necessity is the mother of invention! I couldn't get them to look right any other way. Wow,what a clever way to make things come out near "perfec"! I don't have that large of a saucepan to steam, so it'll not be done :-( Thanks for sharing your "not so good" experience with us so we can all learn! Really, it was because I did a terrible job of wrapping them so they'd keep their shape. :P I used my 12-inch saucepan so it's not that big of a size.